Fifteen year old Anna Goldsmith lies in a coma after an attempted suicide. When Anna Goldsmith moves from Surrey to a new school in a small Yorkshire town she worries she won’t fit in – she’s a bit too brainy and her accent sticks out a mile. But Anna’s got everything going for her - she’s attractive, sporty and musical – and Hayley Parkin, the most popular girl in their year, wants to be her best friend. So Anna reckons she’ll be fine. Except that Hayley is not all she seems. 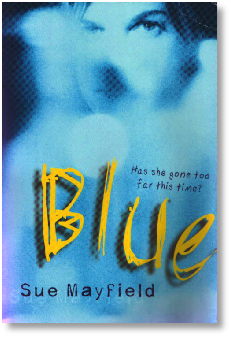 Blue won the 2003 North East Book Award and was nominated for the 2002 Carnegie Medal. Blue is published in the USA as Drowning Anna.